Students at IC have the opportunity to participate in a unique program called Center for Life Skills. In this interdisciplinary program with physical therapy, speech language pathology and therapeutic recreation students, OT students are exposed to learning situations involving adults with various neurological impairments. Programs for improvement in areas of occupational performance are provided for participants. 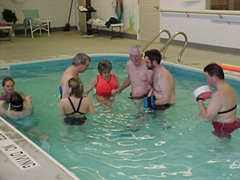 Included in this program are aquatic therapy and intergenerational activities. 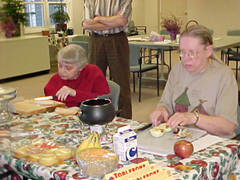 The program takes place at Longview, an adult residential facility across the highway from Ithaca College. 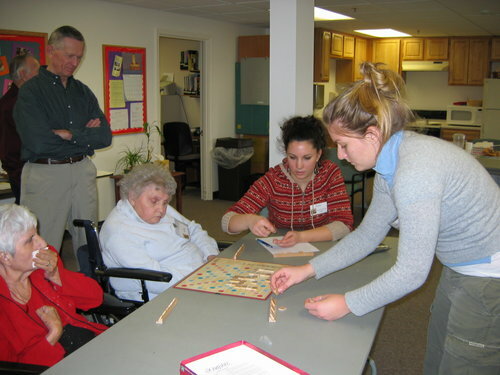 Senior occupational therapy student Karla Spence and senior psychology student Courtney Allaghi play a game of Scrabble with participants of the Center for Life Skills program at Longview. OT students Ashley Hollod, Emily Carey, Jeff Halbert and Professor Carole John working with Tom, a stroke patient in the Aquatic Porgram through Center for Life Skills. Students Ashley Hollod and Jeff Halbert working with Tom in the Aquatic Program through Center for Life Skills.